Lime Post: Save Time + $25 at Spud! 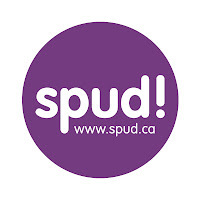 Save Time + $25 at Spud! Let's face it, for most parents back to school means back to rushing about on a hectic schedule. For those of you living in Vancouver, Victoria, Calgary, Seattle, Portland, San Francisco or Los Angeles, we've got a solution: Spud! Spud is an online organic home grocer delivering fresh, local and organic produce and groceries to your home. They feature weekly specials, discounts by the case and multiply offers. Total convenience - and a great healthy start to the school year. give back by supporting local charities and donating leftover food to food outreach groups. To help kick off the back to school season, our friends at Spud are giving us a special offer to pass on to you. Sign up at www.spud.com and use promo code LIME to receive $25 off over your first 4 deliveries - $5 off your each of your first 3 orders, $10 off your 4th. Offer expires Sept 30, 2009. Enjoy! Do you have any thoughts or opinions about eating organic, online grocers or Spud? We'd love to hear from you - leave a comment below! Visit Lavish & Lime for a great selection of eco-friendly back to school ideas like reusable sandwich and snack wraps, stainless steel food containers and PVC-free lunch bags. WIN an Eco-Friendly Reusable Sandwich Wrap! Is it an Eco-Friendly Back-to-School for You?